WynParts - Justrite, 894500, Flammable Storage Cabinet, 45 gal., 18 in. x 43 in. x 65 in. → Justrite, 894500, Flammable Storage Cabinet, 45 gal., 18 in. x 43 in. x 65 in. Justrite, 894500, Flammable Storage Cabinet, 45 gal., 18 in. x 43 in. x 65 in. 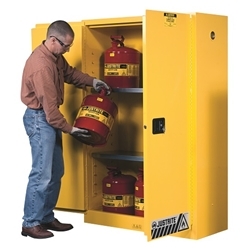 Justrite Sure-Grip® EX safety cabinets offer safe, dependable flammable liquid storage and protection. All cabinets are OSHA compliant and meet NFPA Code 30, and most are independently fire tested and approved by FM Approvals. For added security, U-Loc™ handle comes with a cylinder lock and key set or accepts an optional padlock. Haz-Alert™ reflective warning labels are highly visible under fire conditions or during power outages when illuminated with a flashlight. Patented SpillSlope® galvanized steel shelves direct spills to back and bottom of a leakproof 2” (51-mm) bottom sump. They adjust on 3” (76-mm) centers for versatile storage. Cabinets also feature dual vents with flame arresters, four adjustable self-leveling feet, grounding connector, and trilingual warning label. Durable lead-free epoxy/polyester powder-coat finish provides excellent chemical resistance. Shipped direct from one of 4 Nationwide warehouses typically within 1-2 days. Justrite is the leading source of storage, handling and security products including fire prevention safety equipment for hazardous materials, environmental protection spill containment devices, and specialized storage products. Since 1906 customers have looked to Justrite for innovative solutions to help protect workers, reduce fire risks, and improve productivity. Faithfully tested for unsurpassed quality and compliance to applicable codes and regulations, Justrite safety cabinets, safety cans, specialty containers and storage products and drum handling equipment are shipped from one of 4 convenient Nationwide warehouses.